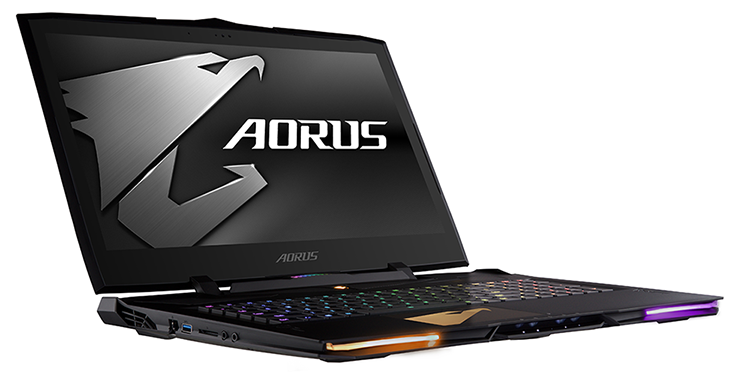 Since its inception in 2014, Aorus has built an established range of high-end gaming laptops in a choice of sizes. The 13.9in X3, 15.6in X5 and 17.3in X7 all have merit, and the trio has helped put Aorus firmly on the map, but there are some users for whom high-end just doesn't cut it. 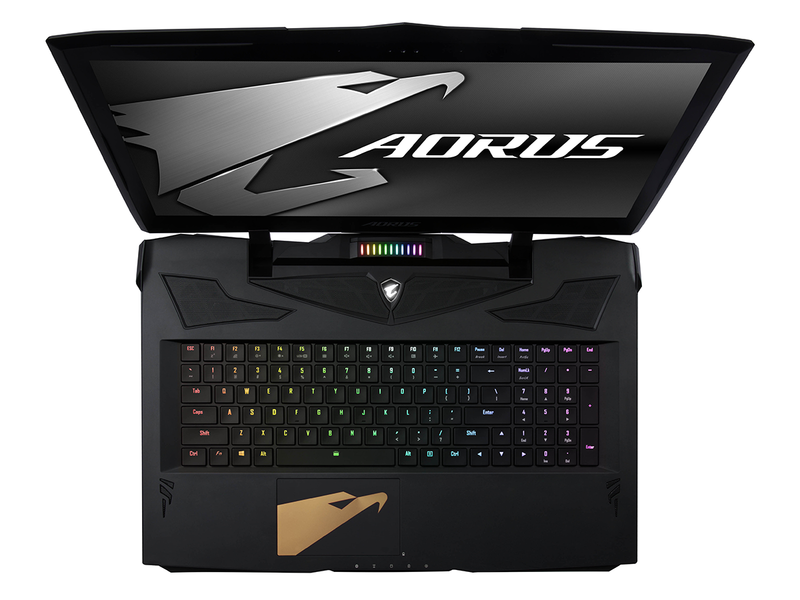 Gamers in this segment tend to prefer to come out all guns blazing, and with said users in mind, Aorus is today unveiling its most powerful laptop to date, the X9. Priced from a jaw-dropping £3,100, this beastie is designed to serve as a step-up from the X7 for anyone willing to splash out in order to go that extra yard. 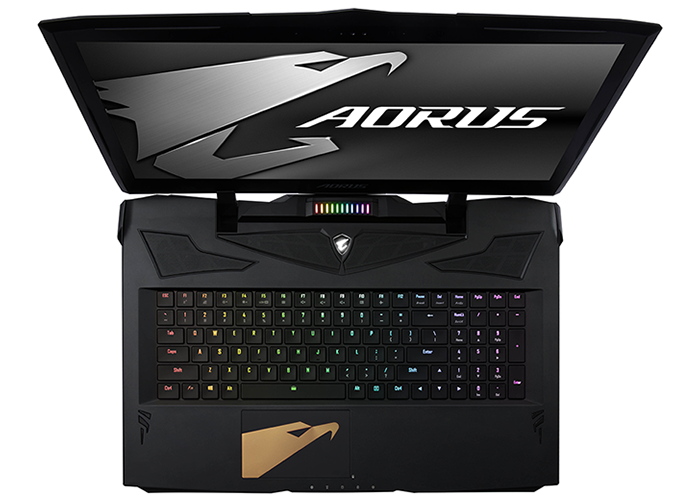 Considering the target audience, it's no surprise to find that Aorus has opted for a more aggressive and ostentatious chassis design, but that isn't necessarily a good thing. 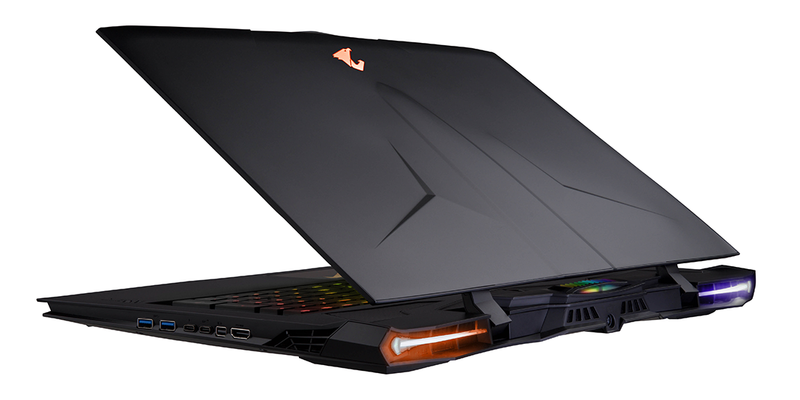 One of Aorus's key strengths thus far has been that its laptops tend to find an aesthetic balance between gaming and business user, but the X9 clearly leans one way. A 17.3in screen size remains consistent with the X7, however the X9 chassis has grown in size to 428mm x 314mm x 29.9mm, making it 7mm chunkier at its thickest point, and a little deeper, too. 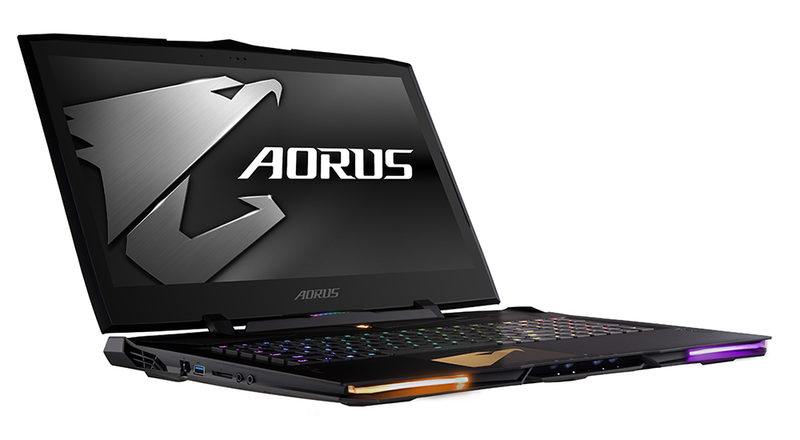 Weight has also increased, going from 3.2kg to 3.6kg, so while Aorus describes the laptop as "ultra thin and light," it's better thought of as a desktop replacement rather than a PC you'll regularly want to carry around. The external profile is certainly going to divide opinions. Some will appreciate the combative appearance, while others will find it garish. Whichever side of the fence you fall on, build quality is reasonably solid throughout, with Aorus using enough metal to ensure a decent amount of rigidity. There is a bit of flex to the display panel, and the plastic light accents on the front and back are bordering on tacky, but there are neither squeaks nor rattles and the keyboard panel feels suitably stiff. In order for the size and design trade-offs to make sense, the X9 needs to pack a serious punch, so what's under the hood? Well, there's no Core i9 part in the mobile space as yet, so the laptop employs the same Core i7-7820HK as the X7. That's joined by a familiar combination of 16GB of DDR4 memory, a 256GB M.2 SSD and a 94Wh battery. 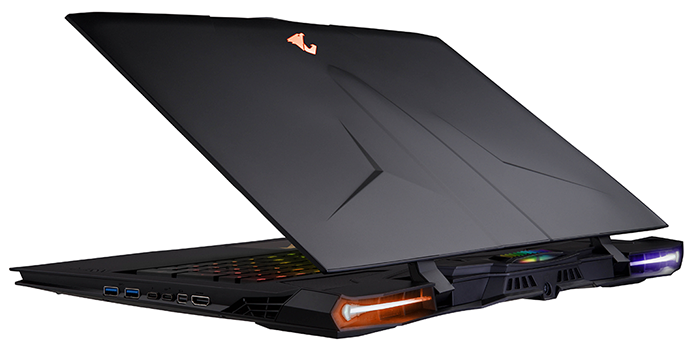 What's changed is the graphics configuration, with Aorus opting to return to SLI by outfitting the X9 with two GeForce GTX 1070 8GB GPUs. At launch, the X9 is primarily an SLI upgrade over the thinner and lighter X7, and that may be a tough sell. Our experience with Nvidia's multi-GPU ecosystem has been mixed in recent years due to diminishing developer support, so we're intrigued to see how the new Aorus will benchmark on a refreshed suite of games. Taking the SLI route does have other potential drawbacks, too; cooling is a key consideration, with the X9 advertised as the world's first laptop to feature a quad-fan design. The four fans manage to keep the CPU and GPU cool under load, but they also create plenty of noise in the process. Channelling the potential of the dual GTX 1070s, the 17.3in TN display touts a 2,560x1,440 resolution and a 120Hz refresh rate that serves as a major boon for high-end gamers. Viewing angles aren't great, mind, and though a 4K IPS option will be available at a later date, we reckon Aorus has missed a trick by not implementing G-Sync support as standard. Nvidia's frame-rate smoothing technology is available to the X7 and it's a feature that would make sense on the X9, where it may help iron out some of the smoothness issues that tend to plague SLI gaming. Large vents are visible on the rear and sides of the laptop, yet these don't prevent Aorus from stocking a wide selection of I/O ports. The left side is home to Gigabit Killer Ethernet (which can be teamed with the Killer Wireless), USB 3.0, an SD card reader and a pair of audio jacks. Over on the right there's a further two USB 3.0, Thunderbolt Type-C, USB 3.1 Type-C, mini-DisplayPort and HDMI, while the connector for the large, 330W power supply is tucked around back. There's plenty of room for a good keyboard and an integrated numpad, with Aorus following in the footsteps of the X7 v7 by implementing keys that are punched out of the chassis to create a more sturdy profile. There are no dedicated macro keys, surprisingly, but every available key can be reprogrammed and the underlying brown mechanical switches provide more travel than any other Aorus laptop in memory, making them really quite pleasant to type on. RGB lighting is of course included with full customisation on offer through the Fusion software utility, and a new RGB HUD above the keyboard provides at-a-glance status information for fan speed, CPU temperature, GPU temperature or battery life. The large trackpad is both roomy and responsive (though we don't care for the Aorus logo), while the stereo speakers pack a surprising punch, thanks to dual subwoofers that help add extra depth. Spending this amount of money on a laptop doesn't mean a completely bloatware-free experience - Aorus still insists on adding shortcuts to legacy apps such as Internet Explorer and to the desktop - but there's no shortage of horsepower. By default, the CPU is overclocked to 4.3GHz and GPU boost frequency is nudged forward from 1,645MHz to 1,695MHz. Our review configuration, priced at a cool £3,300, also increases the amount of DDR4 memory to 32GB (2x16GB) and doubles the size of the SSD to 512GB. Ready to see how the X9 fares in our benchmarks? Let's get to it.